My two week business trip has come to an end and I am getting back into the swing of things here at home. Business trips are a weird thing as its not a real vacation even though you might be somewhere fun. I was so busy that I did not have much time for sightseeing, just two days. I did manage to take some Gorn photos and write a few notes up, but I don’t think I have enough for a full trip Diary. I might just post something along the lines of “My first weekend in Shanghai”. Mainland China (or Real China as I liked to refer to it while I was there) is so different from Hong Kong yet does have a lot of similarities. Granted, it was 10 years ago that I visited Hong Kong for the opening of Hong Kong Disneyland. The first few days were a bit rough as I was admittedly not prepared for all that Shanghai had to offer and was a bit overwealmed. After a few days and a fun weekend sightseeing and some fun days at work, I came around and learned to love where I was. But Josh, why were you in Shanghai anyway? I know I know that’s a great questions and a separate blog post I plan on writing very shortly. Some of you already know, but I am not ready for the big announcement despite the fact it will have a huge impact on this web site and my life! Already there are signs of its impact – My blog a day has been foiled around March 13 or so – really I have 5 drafts that I still need to retro post, but overall the gap during the trip will probably not be filled since my limited access to the Internet while in China prevented me from accessing good stuff and sadly I don’t have the time to go back and post. This entry was posted in Travel on March 30, 2015 by clubjosh. Tomorrow I begin my three week travel adventure – part vacation and part work. The first trip is a planned vacation to Walt Disney World in Florida. I haven’t been since 2011 and it’s about time I see all the latest offerings. This will be my first time using FASTPASS + as well as seeing the new Fantasyland at the Magic Kingdom, the revised Test Track, and many other small Entertainment changes. It will be nice for Daniel and I to get away from it all (although really I’ll be surrounded by work, I will just do my best to ignore and have fun as a Guest). After that, it will be my first business trip since 1996! The last time I went on a paid business trip was to Denver, CO when I was working at UC Davis. I had a great time at that weekend convention. I guess working for my Mom’s work in Puerto Rico and Argentina sort of count as work as well, but this is the first one for my primary employer since Denver. Where am I going? Well to my 31st country – China. Shanghai to be exact. I’ll be there for two weeks and it should be fun to say the least. Now, I am not sure of what the online access ability as well as my leisure vs work schedule, but I will try and do a Trip Diary for Shanghai. Now I need to stock up on my Emergen-C and make sure I do some laps up and down the aisles as it looks like it will be 5+ hours each way to Florida and 14 hours to and 11 hours back from China. This entry was posted in Home Life, Travel on March 7, 2015 by clubjosh. This entry was posted in Travel on March 5, 2015 by clubjosh. I love me some cool drone footage. This entry was posted in Travel on March 3, 2015 by clubjosh. It’s going to get crazy around here starting next week. As much as I will try to keep updating Club Josh every day, my March travel arrangements probably will result in some gaps. Daily readers of the site know that I usually go a few days and then retro-post when I can to catch up on my Blog a Day. This month I will be traveling to Florida and the Far East which will probably result in a longer delay than usual. I hope to make it up in some great photos and of course some Trip Diaries! Because my Far East trip is for business, it will be similar to Puerto Rico in 2009 where there were a lot of “Working today, having dinner, and heading to bed” entries followed by a couple nice long ones for the days I get off. The good news is that research has shown that Club Josh is accessible where I am going so that is a big plus! This entry was posted in Home Life, Travel on March 2, 2015 by clubjosh. My friends in Shanghai told me that Chinese New Year celebrations are off the charts. Sploid posted this video from YouTuber Parelius shot from a plane landing in Beijing, China during the celebration. This entry was posted in Travel on February 24, 2015 by clubjosh. 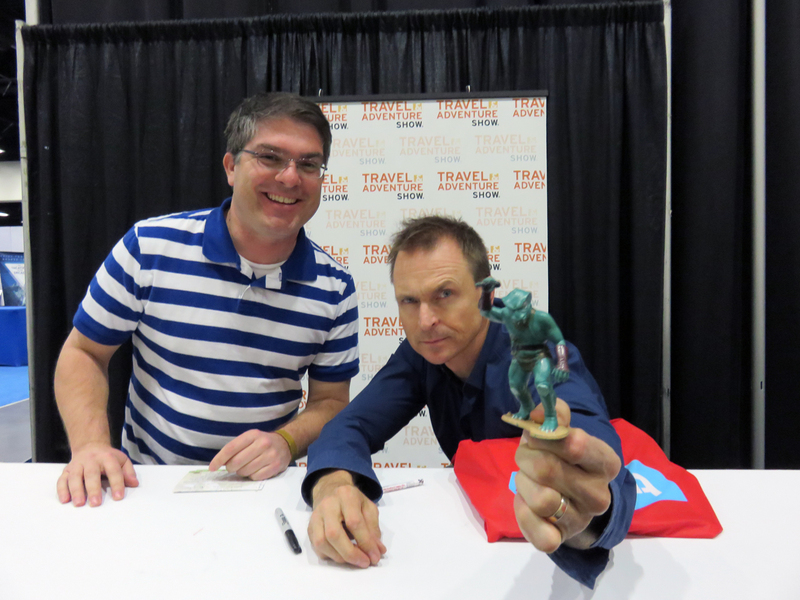 Yesterday, Daniel and I traveled to San Diego to meet the host of TV’s The Amazing Race, Phil Keoghan. He was speaking at the Travel and Adventure show at the San Diego Convention Center. We found out about his engagement via his twitter account, and as soon as we knew he was going to be there, we booked a trip on the train. Riding the train is always fun with the only drawbacks being you have to put up with the other people on the train. One thing I like about driving is you only have to deal with your people in the car. The show itself was pretty small compared to previous ones we have attended at the LA Convention Center, but it as only their second year in San Diego, so I’m thinking it will grow in the future. The highlight for us was certainly listening to Phil give his talk and we managed to get seats in the second row. For the autographs, they ran out of books so I had Phil sign my bag before taking a photo with the Gorn. Daniel lucked out and managed to get an autographed photo and bonded with Phil. A great day trip! The only drawback was the long wait for our train back to Anaheim, but with web surfing and people watching, the time passed quickly. I’ve posted the photo to the Celebrity section of the Gorn Page where you can see all the other celebs that the Gorn has met! This entry was posted in Celebrity, Photos, Travel on February 16, 2015 by clubjosh. This entry was posted in Club Josh, Travel, Web Related on February 9, 2015 by clubjosh. Here is a fun video of Nathan driving Mark and I around Madeira on my last day on the island. This entry was posted in Travel on January 26, 2015 by clubjosh. I’ve actually posted the first pass of my travel diary for Europe 2014 in the Trip Diaries section of the site. I’ve actually removed the two entries I had here in the main blog since it was a duplicate of what I’ve placed there. Normally, I just leave the duplication, but since each day I was able to post a photo, I’m OK with no diaries here. Hopefully it will get more of you to check that section out! Here is the Europe 2014 Trip Diary! The next step is to actually drop some highlight photos and figure out how to add some galleries so I can post a small portion of the 600 photos I took on the trip. I also need to add the maps to the main archive page of the trip, but then again I still need to do that for every trip from 2000-2014. But hey it’s a start. Any grammar and typo corrections are welcome.. This entry was posted in Club Josh, Travel on January 18, 2015 by clubjosh. © 1992-2019 Josh Catalfo. All Rights Reserved.